/ Articles / Future Forward: Can Cross-Laminated Timber Replace Concrete and Steel? This page profiles innovative and impactful applied research in civil and structural engineering. 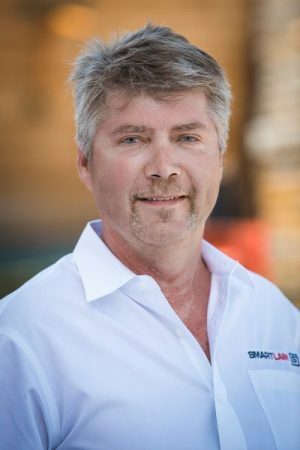 With a background as a builder and developer in construction for 35 years, Casey Malmquist is CEO and president of SmartLam, the first commercial manufacturers of cross-laminated timber (CLT) in the United States. He has a bachelor of science degree in environmental studies from Gustavus Adolphus College in Minnesota. laminated beams, nail-laminated timber and CLT. SmartLam Technologies makes large panels of CLT—no typical size, but its current press is 10 feet by 40 feet by about 14 inches deep. CLT is made with successive layers of dimensional lumber that are typically laid perpendicular to one another. Each layer has an adhesive applied, and then the layers are hydraulically compressed for a specific amount of time to create a monolithic slab of wood that “pound for pound” is stronger than concrete or steel. Wood is a carbon store, so in the net carbon equation, CLT isn’t carbon neutral, but close, as opposed to very high carbon emissions in concrete and steel. Malmquist notes that in the United States, construction materials and activities contribute more to carbon emissions than automobiles. Most of the tree stock used to make CLT is 12-inch diameter or less, making it sustainably harvestable. According to Malmquist, the company’s production capability on the new plant is about 48 billion board feet annually, which is about 12,000 logging trucks. He notes that it takes the North American forest only five hours and 12 minutes to regenerate that amount of wood fiber. Why CLT over Steel or Concrete? Lesser weight is a key benefit of CLT, and speed of build is another incentive. Unlike concrete, which is poured into place, CLT panels are custom milled to become part of a building system that’s lifted into place onsite. Considering it’s made of wood, fire resistance is a surprising area in which CLT outperforms steel and concrete in tests performed in Europe, where CLT has been in use for more than 25 years. Similar tests in the United States support these findings. He cites a wide range of projects CLT currently is used for, such as crane mats or access mats for industrial projects; erecting multi-story buildings; furniture; agricultural buildings; train stations; and modular elevator shafts, which can be built much faster via CLT than with typical concrete masonry units. To help find more uses of CLT, SmartLam Technologies invests about 20 percent of its resources into research and development, which also includes testing for fire, seismic and acoustic performance. SmarLam Technologies currently has a plant in northwest Montana, and within three years it plans to build a plant in the northeast and then the southeast as the market continues to develop and expand.